Recycling GT’s or other bottles is a great way to package your completed brew. 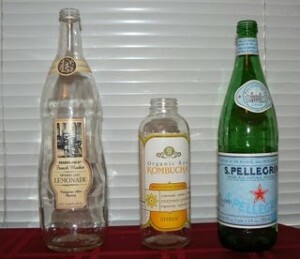 I also like to use San Pellegrino bottles and the Trader Joe’s Lemonade bottles to transport my Kombucha. However, when I bring it to a party or event, I want the guests to know the contents of the bottle without being confused. In that case, it’s quick and easy to remove the old labels. 1. 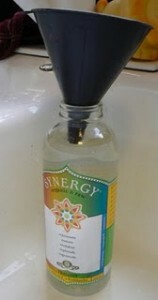 Funnel hot water into the bottle up to the top of the label. Be careful to avoid getting the label wet. The hot water will loosen the adhesive so that you can easily remove the label. 2. Replace the lid. Let the hot water stand for 2-5 minutes. 3. Starting at the seam, gently coax the label off. If the top layer and bottom layer start to separate, slow down. Press the label back on to the bottle to reconnect the layers and then start again. Although it may seem tedious the first couple of times, once you get the hang of it, it goes quite quickly. *You can also try using a hair dryer to heat the adhesive and remove that way. The secret to getting sticky things off of surfaces is anything oily, which is why peanut butter, baby oil, olive and coconut oil all work. This is also true of pine pitch ? I have found the easiest way to remove labels is to put bottles etc in the dishwasher. I usually put in dishwasher after emptying and over night. Don’t run the dishwasher. Just the heat alone in the dishwasher losens the glue. In the morning when I remove the bottle, the label comes clean off. Nearly 95% clean and just rub the little bit of stickyness off with a scrubber, oil, Castile soap etc. We gave your tip a try and found that if we didn’t remove the bottle as soon as the cycle finished, it ended up too cold to remove the label. Likely different dishwashers have different temperature ranges – would work well in those that have a heat setting. Thanks for sharing! i recommend using extremely hot water. Just remove the label. There is no need to do it slowly. Then rub off the adhesive with oil on a napkin. Coconut oil worked for me. Finally, discard the water and wash the oil off with soap. Peanut butter removes adhesive. I just removed labels from two different types of bottles, I left the hot water in the bottles and smeared peanut butter on the adhesive. I thought oh no–what a mess. BUT, the adhesive came right off with a rub from a dish cloth. A unique trick for remaining adhesive is to use the sticky side of the removed label — to remove the leftover goo. Take the label, press the sticky side to the remaining goo, and pull off at a slight angle. Do this repeatedly until all the stickiness is off the item and on the label. WD-40 removes the goo with a little elbow grease. I fill with hot water from the tap prior to washing dishes. I then place the bottle in the dish water while I wash the dishes. When I’m ready to remove the label, I hold the bottle in my left hand with the cap facing toward me. I take a small, sharp knife from our kitchen drawer and cut the label from top to bottom about a half inch from the seam (am not sure if this makes a difference), then I just take the cut edge and try to work it off (from top to bottom). Tiny bit of effort at the very beginning because you want to catch the label and the silver layer beneath it. The entire label comes off in one piece and it only takes me about 30 seconds. Lemon essential oil works really well to remove the goo. I put drops on the goo and spread around with my finger all over the goo surface, let set several minutes to absorb. Then I use a paper towel to remove. I’ve been satisfied with the end result and the room has a lovely clean lemon scent as a bonus. Hannah Crum they have changed the adhesive that holds the labels on the GT bottles….I have used baby Oil an it doesn’t even get it off all of them. One thing you can use is soaking the bottles in Distilled white vinegar (not to expensive) You DO NOT want to put the bottles in your dishwasher to get the labels off as that leaves all that adhesive inside your dishwasher. Found that out the hard way. The best thing that isn’t a commercial remover is vinegar. I get a big bucket and fill it with like 2 or 3 gallons of vinegar they are like $3 or $4 for a gallon and I did like 2cases of bottles. You just set them in the vinegar and let it sit for about 20 minutes to 30 is what I did then with gloves on and a green scrubby (only if needed) usually the peel right off. Thanks for what you do Hannah. Thanks for the updated advice Sherry! To remove labels soak a paper towel or dishcloth in any kind of vinegar and wrap it around the bottle/jar for 10-15 minutes. The label and adhesive should come off easily, though if it’s being stubborn, use steel wool and remove the remainder with a little soap and hot water. If you’re worried about scratches (I’ve never had a problem) you can use a regular sponge instead, or even a crumpled piece of foil. This method has worked for me every time. I put mine in my dishwasher (bottles as of end of 2013-2014) with the “extra heat” setting for the water turned on and with the dry function OFF (or open door b4 dry cycle) Once bottles are cool enough to handle I slip the point of a knife under an edge and carefully pull them off using hot tap water as needed. I rarely end up with leftover adhesive as long as I pull carefully. It doesn’t work if you let them dry again. I let the bottles soak in water. It’s best to remove the mylar label after a few hours of soaking. Then let the bottle remain in water for a few more hours. I then use a plastic scraper to remove the label and glue, which comes off fairly easy at this point. My bottles look great. Massaging olive oil into the adhesive, allowing the to sit for 10 mins, then scrubbing with Dawn also works like a miracle for any hard to get bits of adhesive. I use steel wool with hot water and dish soap to remove the labels. Just peel off as much of the top layer as possible, then smear the dish liquid over the sticky part, and let it sit for a minute. Then use the scouring pad to ‘scratch’ off the remaining sticky stuff. I just tried this in three gt’s bottles. 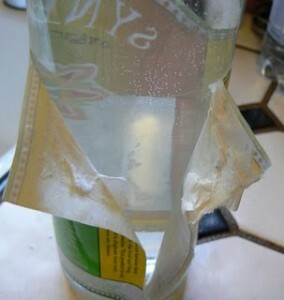 The label indeed came off, but there remained a sticky layer on the bottle, unlike the photo you show here. I’m not sure if their adhesive has changed since you posted this, or if I’m doing something wrong I tried another bottle with almost boiling water, and that didn’t change anything. The first three were just hot water from the tap, and I left them there around 3 minutes. I followed the above instructs precisely. Help! I could use an adhesive remover at this point, but that’s rather toxic, and I was hoping this is a technique issue. Might try heating the water so it will melt the adhesive. It certainly could have changed since the post was written. Anyone else have any tips or pointers? Rubbing alcohol works great for removing any residual adhesive. Much less (almost none) toxic residue whereas the Goo Gone contains highly toxic chlorinated hydrocarbons which need to scrubbed off with soap. Ken – thanks so much for the rubbing alcohol tip! Works like a charm! I was using the Goo Be Gone and dreaded taking the labels off because of it. Messy and stinky! UGH! I have a backload of 24+ GT bottles to clean and it’s so much easier now with the hot water/rubbing alcohol combo. Equal parts vegetable oil and baking soda! Let sit for a few minutes and wipe away with a towel. Good as new! I’ve tried using this method and it works fantastically for removing the label, but I always have almost all of the adhesive left behind. Is there anything else I could try? I’ve varied my waiting times and made the water hotter and hotter with each attempt, but always have very stubborn adhesive left over. This tip is a few years old – could be the adhesive has changed. Some find that baby oil works well (trying to think of a non-petroleum based substitute) or Goo Be Gone. Anyone have a suggestion? Goo Be Gone is the best to remove glue of any kind from anything. My learnings come before reading Hannah’s tip. I use a medium size cooler, fill it with warm water and submerge a bunch of bottles and leave them there. After a few hours, I use a razor blade tool to remove the label. If they don’t come off cleanly, I just put them back to soak some more. Goo be bone works, but I decided I didn’t want to use something that volatile. Citrus essential oils work great. Yes, I have been using “go gone” gel spray for long time now. It removes stickers, labels and adhesive left behind by scraping the label. works fantasticly. Just let it stand for several minutes and wipe clean a couple of times with a paper towel and voila! ? This is a stellar idea. I have labels to take off 45 or so bottles for an art project & this has helped tremendously! I can't thank you enough! Do you know where to buy replacement tops for the kambucha bottles? The metal tops start to rust after a few uses…I was looking for plastic tops that will fit the GT bottles. If you have information, will you please email me? Tcmoorman@aol.com. Thanks! Kombucha Kamp sells them now. THANK YOU for this tip! I’ve been so sad to toss those bottles in the recycle bin but always ended up sticky mess when trying to remove mylar labels. Can’t wait to try this!!! Thank you for all of the info. you are sharing!! I met Hannah in a class we were both taking. One day, I saw her drinking Kombucha and we immediately shared our love for the drink. Then she told me that she taught a class on how to make it. I made sure to be at the next one. I thought I knew almost everything I needed to know about Kombucha because I had been drinking it for two years. But Hannah’s class taught me so much more! To add to the fun, I was also in a class that was being taped for a Texas food network show. I have been making Kombucha for almost a year now. I have increased energy, better digestion, and I’ve saved so much money. And my friends love to drink it when they come over. Thanks Kombucha Kamp!